With a frame coming in at just 2060g, the 2019 Blur is the lightest full suspension frame that Santa Cruz has ever created. The super stiff carbon frameset utilizes the renowned VPP (virtual pivot point) suspension design to create a bike that is ultra-efficient. Pair the Blur frame with a dual remote lockout for the fork and shock, you achieve a bike that utilizes every ounce of energy that you put into it. For the descents and flat-out sprints, the confidence inspiring geometry gives you all the control and precision you need to beat the competition. The Blur CC X01 TR comes with an elite built kit that is ready to win races. The Fox ultra-light step-cast 34 Performance Elite fork and Float Performance DPS rear shock effortlessly smooths out the trail in front of you, the SRAM X01 Eagle 12-speed drivetrain gives you the gear range to make it up the steepest climbs and sprint down the fastest descents, and SRAM level TLM brakes give you incredible stopping power and modulation when things get rough. 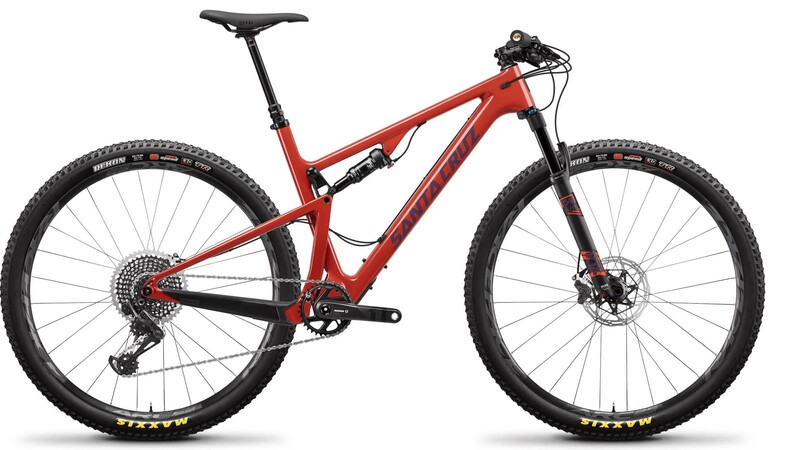 The 2019 Blur was designed to win, but it works just as well for the avid weekend warrior. The days of non-fun XC bikes are gone. No matter the application, a day on the 2019 Blur is fun no matter who is riding it. If your idea of fun is pushing your body to the absolute limit and then riding another lap, you’ll have a blast. If your idea of fun is long adventurous XC loops in your hometown, then you’ll love it too. From the top of a podium, to miles away from any civilization, the 2019 Blur will take you where you want to go. FOX Step-Cast 34 Performance Elite, 110mm, 29"
Does this model come with carbon rims?